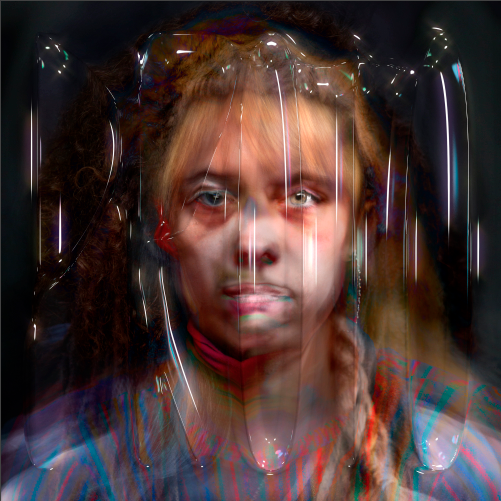 In support of her forthcoming album, PROTO (out 10 May), Holly Herndon has announced an inaugural headline performance at London’s Barbican on Wednesday 16th October as well as a summer show in her adopted home city, Berlin. Tickets go on general sale this Friday at 10AM GMT. A hybrid of studio project and touring band, Herndon’s live show will incorporate an expanded vocal ensemble and a newly developed A/V experience. Holly’s third full-length album PROTO (out 10 May) isn’t about A.I., but much of it was created in collaboration with her own A.I. ‘baby’, Spawn. For the album, she assembled a contemporary ensemble of vocalists, developers and an inhuman intelligence housed in a DIY souped-up gaming PC to create a record that encompasses live vocal processing and timeless folk singing, and places an emphasis on alien song craft and new forms of communion. PROTO makes reference to what Holly refers to as the protocol era, where rapidly surfacing ideological battles over the future of A.I. protocols, centralised and decentralised internet protocols, and personal and political protocols compel us to ask ourselves who are we, what are we, what do we stand for, and what are we heading towards? ‘Eternal' follows the 2018 release of Holly and Jlin’s collaborative song ‘Godmother (feat. Spawn)’. The skittering track, which was created by Spawn reimagining the artworks of her ‘godmother’ Jlin in a trained model of her mother’s voice with no editing or sample trickery, was praised everywhere from NPR to The Guardian to New York Times, and elsewhere. You can hear traces of Spawn throughout the album, developed in partnership with long time collaborator Mathew Dryhurst and ensemble developer Jules LaPlace, and even eavesdrop on the live training ceremonies conducted in Berlin, in which hundreds of people were gathered to teach Spawn how to identify and reinterpret unfamiliar sounds in group call-and-response singing sessions; a contemporary update on the religious gathering Holly was raised amongst in her upbringing in East Tennessee. Since her arrival in 2012, Holly has successfully mined the edges of electronic and Avant Garde pop and emerged with a dynamic and disruptive canon of her own, all while studying for her soon-to-be-completed PhD at Stanford University, researching machine learning and music. Her LP Platform closed out 2015 by gracing year-end lists from Pitchfork, The Guardian, Uncut, and The Wire. In the aftermath, Radiohead hand-picked her to open up their European tour. Just as Platform forewarned of the manipulative personal and political impacts of prying social media platforms long before popular acceptance, PROTO is a euphoric and principled statement setting the shape of things to come.